Trim the excess fat from the short rib. Sear the short ribs in a hot pan until well-browned, then transfer to a large pot, along with the chopped vegetables, chilli, salt, peppercorns and 2 litres water. Braise at roughly 70°C until tender – this can take up to 4 hours. Carefully remove the short rib and set aside to rest. Pass the cooking liquor through a sieve and reserve 300g of the liquid. Place this liquid in a pan and reduce by half (150g). To make the glaze, use a blowtorch to flame the sake in a pan on the stove top. Add the bergamot juice, zest, chilli powder and sugar. Stir to dissolve. Add the 150g reduced cooking liquor and the honey, along with the braised short rib and leave to marinade for 6 hours in the fridge. To finish, light the BBQ and once ready, remove the ribs from the glaze and place on the grill. 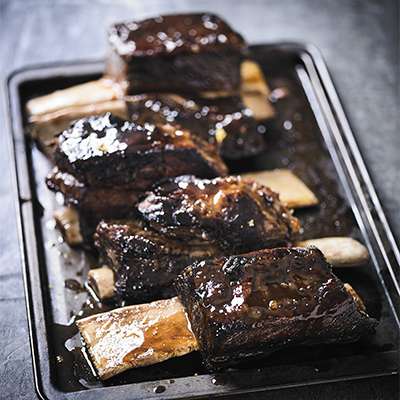 Brush the ribs with the glaze and continue to brush until the short ribs are sticky and caramelised and the ribs are warm in the centre – this should take around 20 minutes.